Julian Cope's Krautrocksampler is a brilliant book that did much to promote the trancy, indulgent, cross-genre musical hybrids that emerged from Germany late in the sixties, flowered and diversified through the seventies, then did much to pave the way for punk and post-punk idioms. Published in 1995 and receiving a second issuing the following year, this book is drenched in drugs, hyperbolic prose and nostalgia. Krautrock was taken up in the British media, John Peel being a particular exponent. The term itself is pejorative at the first instance, but has been seen to be redeemed through use by the bands themselves. I prefer the term Kosmische Musik, since it says a lot more about what the music is trying to do, rather than ethnically labeling the producers. 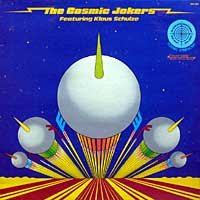 For those who haven't heard Kosmische, it can be difficult to describe. This is entirely expected because, like many other music labels, it is used for convenience to group artists who are perceived as acting in a certain sphere, had temporal and geographic proximity. Otherwise it might be difficult to see what Faust, Can, Cluster, Tangerine Dream, Neu! and Amon Düül had in common. The Kosmische sound is a mix of diverse influences. From contemporary composition the name Karlheinz Stockhausen is the first to be mentioned, having a direct pedagogical impact on Can and others. This electronic avant-garde stream was joined by an American west-coast psychedelic sound, Indian classical music, the drone-based (John Cale) side of Velvet Underground, an open jazz aesthetic and pure rock noise taking Hendrix and others to an extreme. The last ten years has seen many groups emerge following in the Kosmische tradition, so today the sound is at once more comfortable and familiar, but also less special than it would have been in 1969 or even 1975. Tortoise, Radiohead, Stereolab and Wilco are only some of the groups who have mined the Krautrock vein. I have been in love with aspects of this music throughout my entire musical career. I came at the groups piecemeal, and never saw their efforts as part of some unified whole (they aren't in any case) until Cope's book. After recently re-reading Krautrocksampler for about the fourth time, I decided to fill in the gaps in my knowledge. Writing of the post-punk version of Krautrock, Cope says it was "not remotely hippy" but "soaringly idealistic and hard as nails". It is that side of the music that I am most in love with, though I love a good drone, as my own music shows. In future articles I hope to offer my own reviews of this music, from a contemporary viewpoint. I have none of the extreme subjectivity which makes Cope's book so entertaining... and his recommendations occasionally so misleading. Neither was this music as crucial to me as it was to Cope. He sees it as part of some mystical process to higher learning, though of course he can never say what benefits this quasi-religious experience might in fact have. My views will supplement Cope's Head Heritage take, and might possibly be an antidote to sites like the Prog Archives which contain far too much uncritical prose. For those looking for Krautrocksampler, be aware it sometimes sells for enormous sums of money, with only the German version being available in print. Given that there are 10,000 copies out there, the price seems hardly to be justified. You may be interested in Cope's Drudical Q&A on the book. What Should I Write? You Tell Me!